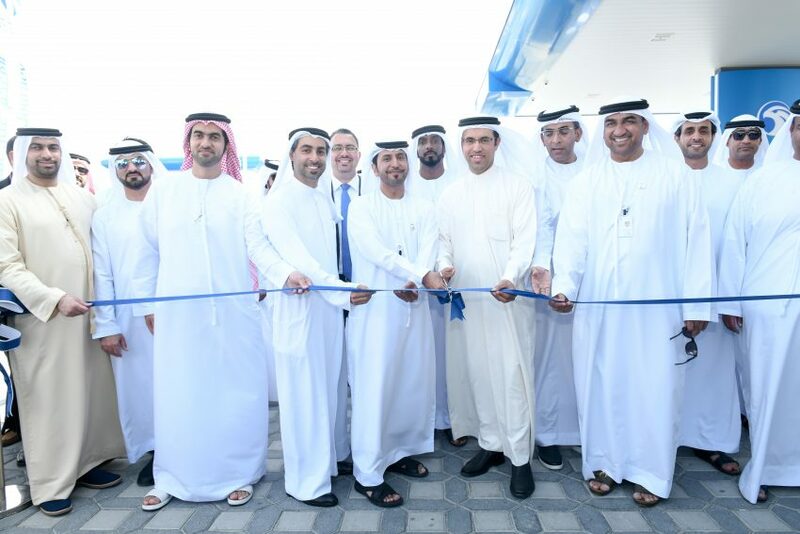 Abu Dhabi based ADNOC Distribution has celebrated the launch its first three service stations in neighbouring Dubai – meaning the UAE’s largest fuel and convenience retailer now operates in all seven emirates. The three stations are located in Dubai Investment Park, Umm Eselay (Al Ain Road), and Al Qusais. An opening ceremony and ribbon-cutting took place at the DIP station today (Wednesday), led by ADNOC Distribution’s acting CEO, Saeed Al Rashdi, chief retail officer Nasser Al Hammadi, and Abdulla Al Qubaisi, operations director at the Investment Corporation of Dubai. The celebrations come a month after the Dubai service stations were opened; a move that fulfilled one of ADNOC Distribution’s commitments as part of its IPO in December 2017. At the time the firm outlined its plans to expand into Dubai and Saudi Arabia before the end of 2018, markets it successfully moved into before the turn of the year with two stations in Saudi Arabia, as well as the three in Dubai. Speaking at the event in DIP, Al Rashdi said: “ADNOC Distribution’s entry into Dubai is our opportunity to showcase to customers our great service and products. I would also like to acknowledge our partners in these three stations, ICD, with whom we worked closely to enter the Dubai market. The three new service stations in Dubai include solar panels, Géant Express convenience stores, Oasis Cafés, free Wi-Fi and Electric Vehicle (EV) chargers that recharge electric vehicles up to 80 per cent in 20 minutes. The Umm Eselay station includes five fueling islands as well as McDonalds and Rainbow restaurants, opening in the coming weeks, while the DIP station features six islands, ADNOC Lube service, and McDonalds and KFC restaurants. The Al Qusais station offers customers seven islands, ADNOC Lube service, and Burger King and KFC restaurants. Fuels on offer at all three stations include E-Plus 91, Special 95 and Super 98 gasoline, as well as diesel fuel. The company’s Flex service will also be rolled out across Dubai in the coming months, following an initial free trial period to allow customers to familiarise themselves with the programme. Under Flex, customers can refuel their own cars, or pay an additional Dhs10 for attendants to assist them. Wednesday’s opening ceremony also featured a live art performance by Dubai mural artist Ramy Elzaghawy, who painted an ADNOC Distribution fuel truck with an original design based on the national symbol of the falcon, which is also part of ADNOC Distribution’s logo.